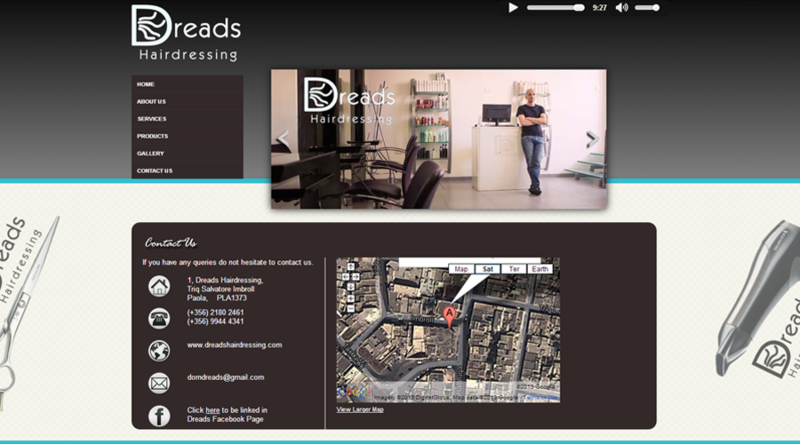 This website was developed for a hair salon named Dreads Hairdressing located in Paola, Malta. This is one of the best hair studios in Malta since they offer great services to customers and also make great and fashionable hairstyles. 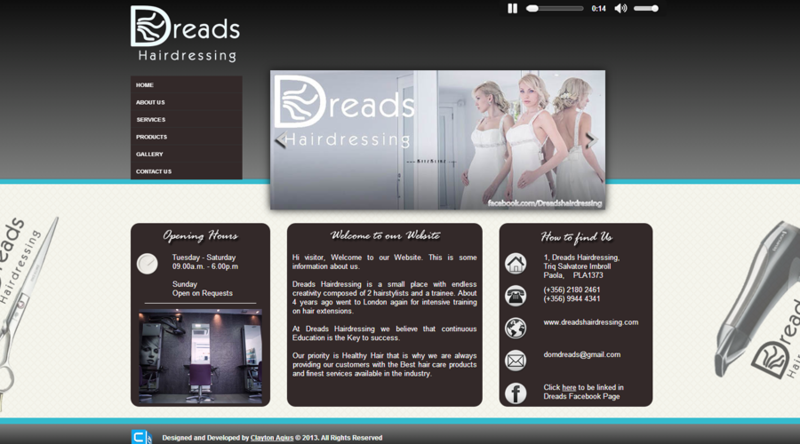 This website is divided into the Home Page which contains some information about the Opening Hours, a brief information about Dreads Hairdressing and information how to contact this Hair Salon. 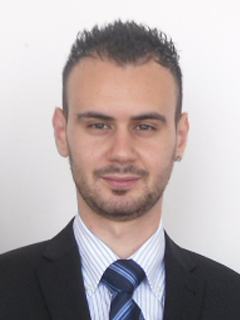 The About Page contains the information about Dreads Hairdressing, the Mission Statement and Dominic's Bio (Mr. Dominic Bartolo is the owner of Dreads Hairdressing). 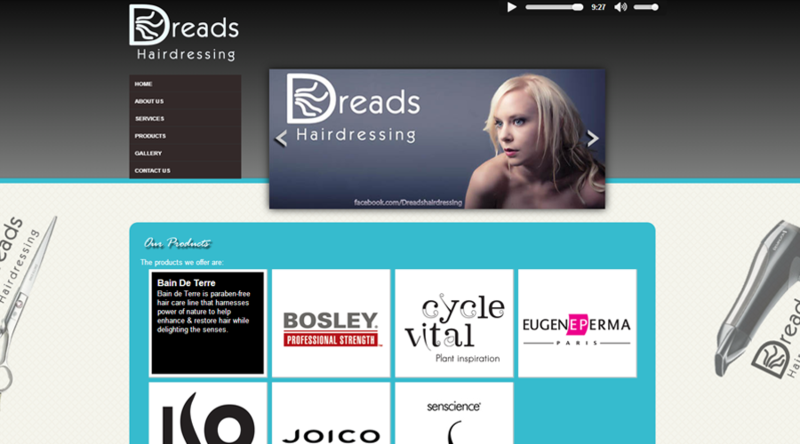 The Services Page contains a list of services that this Professional Hair Salon offers. 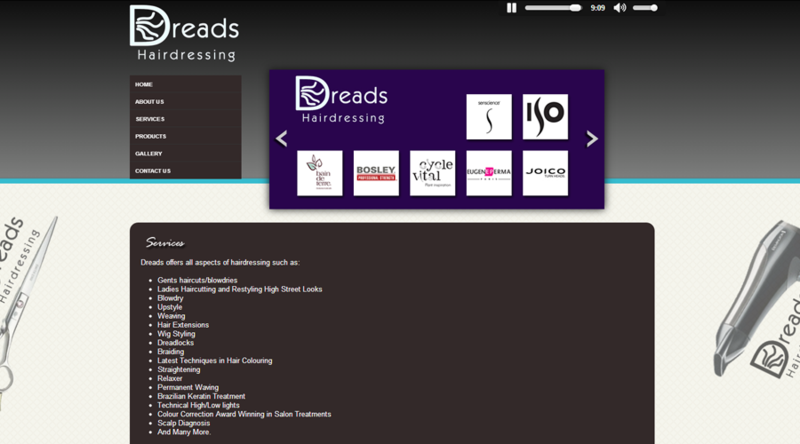 The Products page contains the Brands that Dreads Hairdressing use. 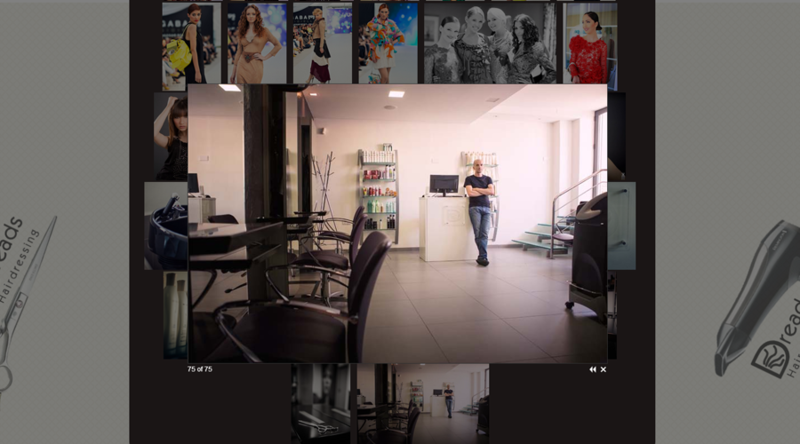 The Gallery Page contains the Photos of Hairstyles that Dreads Hairdressing make, this page also contains some photos of their Luxury Hair Studio. 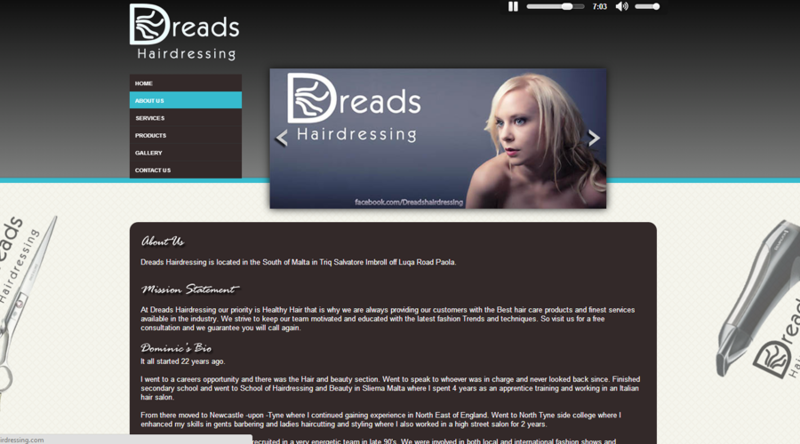 The Contact Page contains the Contact information and a map where Dreads Hairdressing is located. 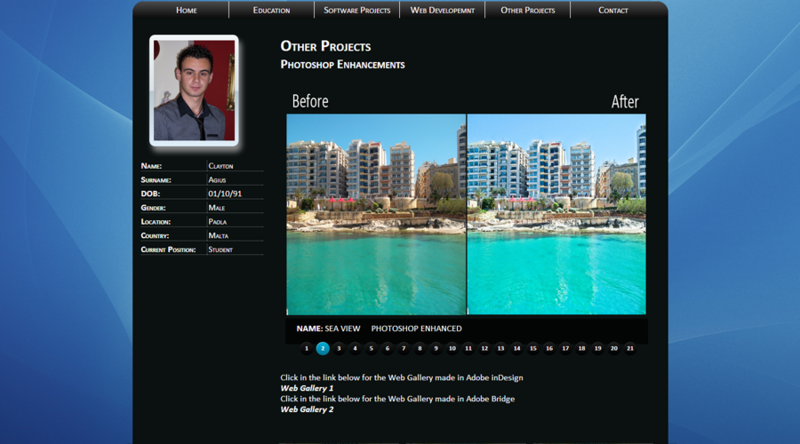 This website was developed for Mrs. Violet Vella which is one of the best makeup artist in Malta. She offers great services to customers and also make professional makeup. 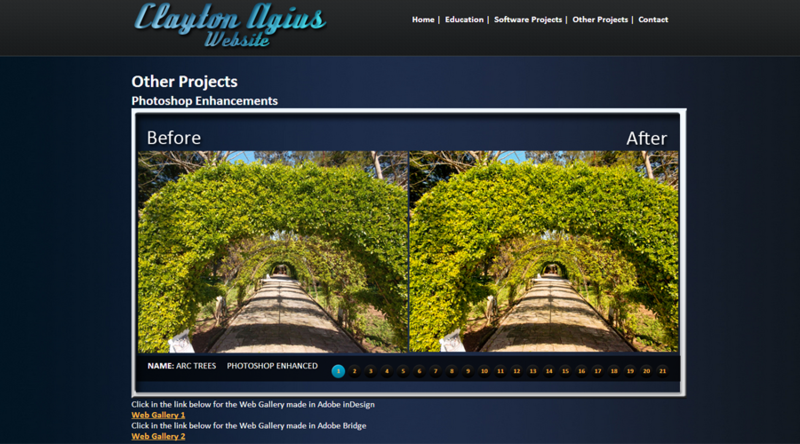 This website is divided into the Home Page which contains some images that changes in a few amount of seconds. 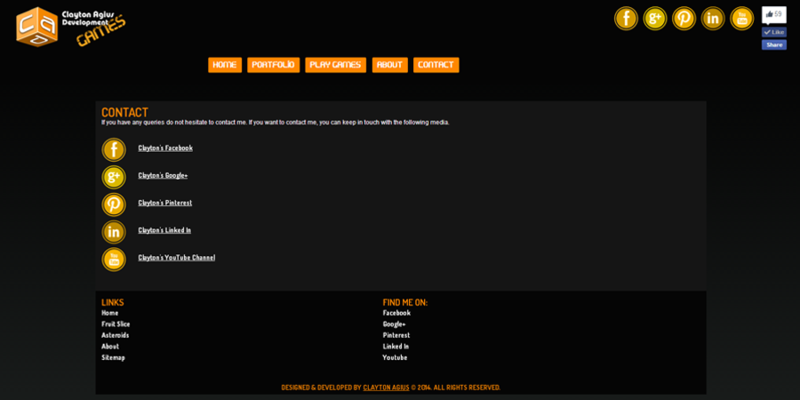 The Gallery page has some links to other pages such as Bridal, Bodyart, Creative, Themed, etc. The About Page contains the information about Mrs. Violet Vella and the Mission Statement. The Services Page contains a list of services that this Professional Makeup Artist offers. 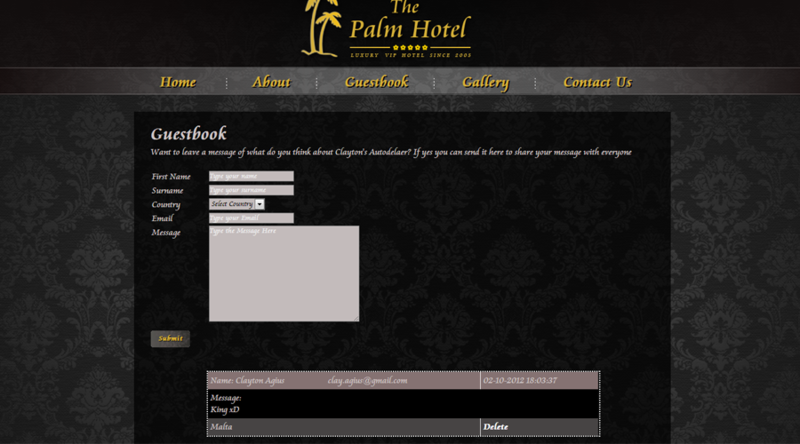 Contact Page contains the Contact information. 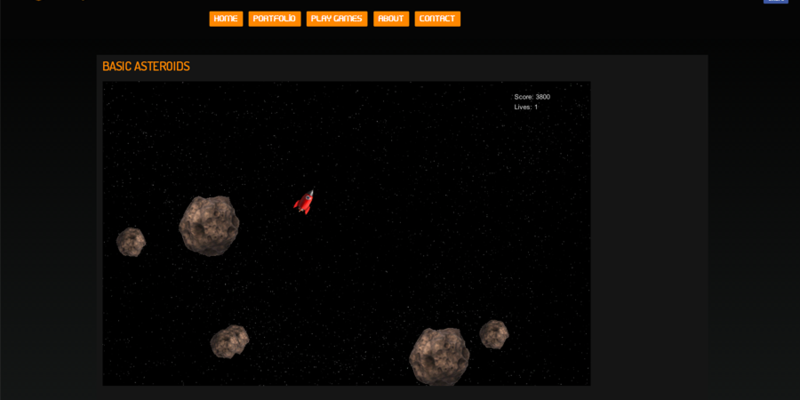 This website was developed to show my developed games created by the Unity Game Engine. 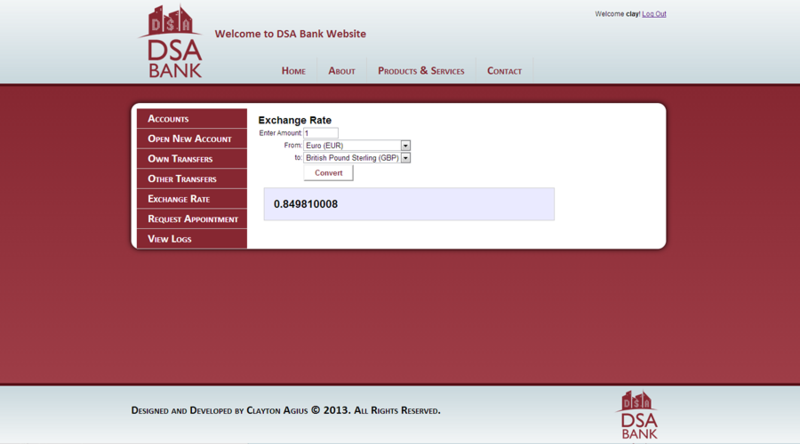 This website was implemented for the Distributed Software Applications (DSA) subject. 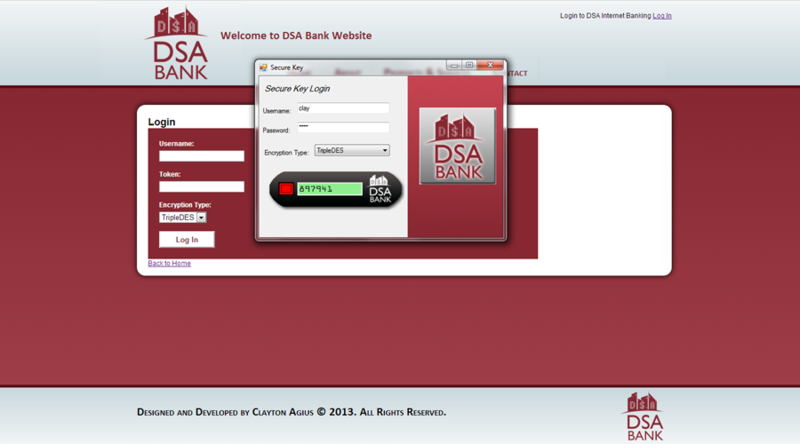 My tasks were to built a Windows Form Application for the Secure Key and a Web Application so that the user could check his/her account details, Open New Account, Make Transfers, Set Appointment, etc. 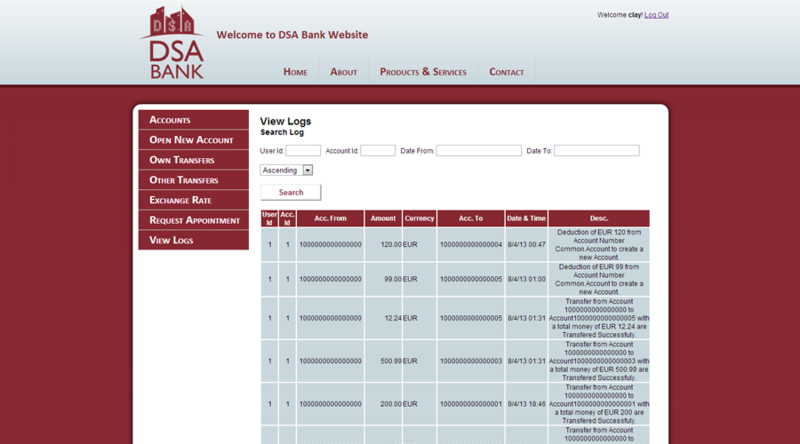 This project is implemented using MVC (Models, Views and Controllers) and I also designed it in three tier architecture. 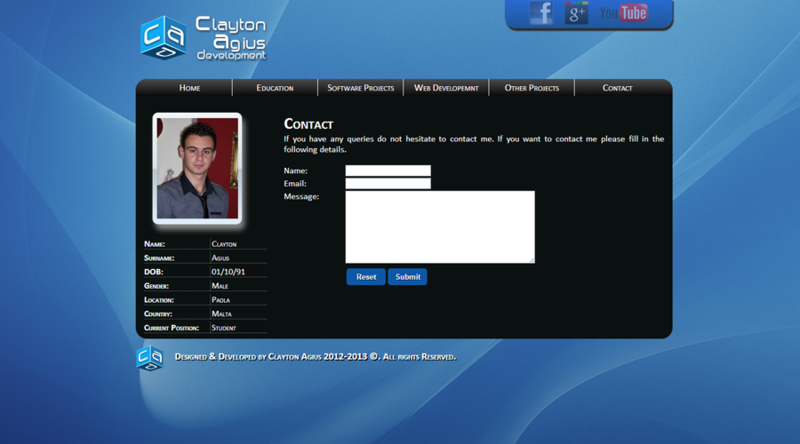 This Application only consists of two user roles, which are Manager and Client. A client can send an appointment to a Manger and the Manager can Accept or Reject an Appointment. Once the Manger accepts the appointment, a .ics file will be sent to the client in order to be shown in his Google calendar. The User can also generate a PDF report with the searched Transaction of a Particular Account using iTextSharp library which this PDF File can be saved or printed in a professional structured Manner. 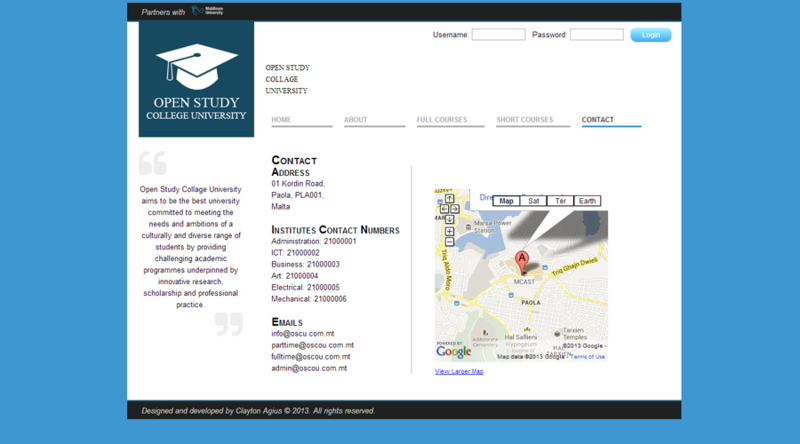 This website was implemented for the Programming in .NET (PIN) subject. 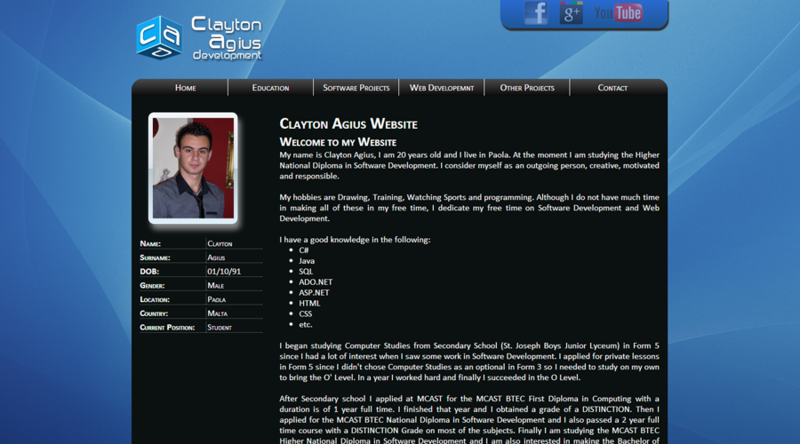 My tasks were to make a Web Application that will allow the User to create a theme. 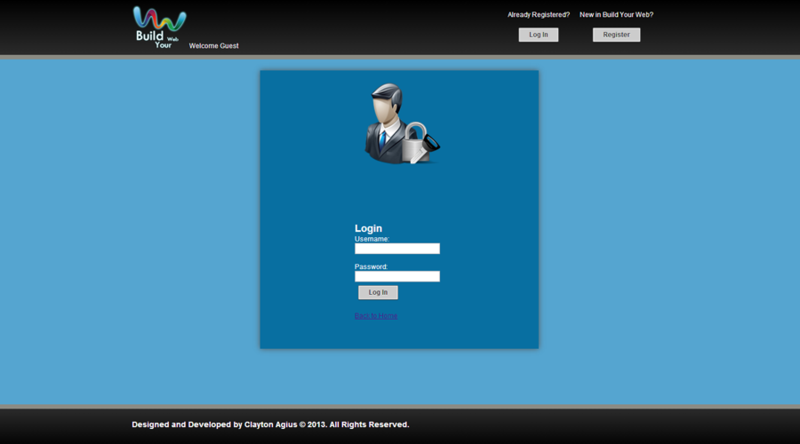 This is done by allowing the User to Register and then Login. 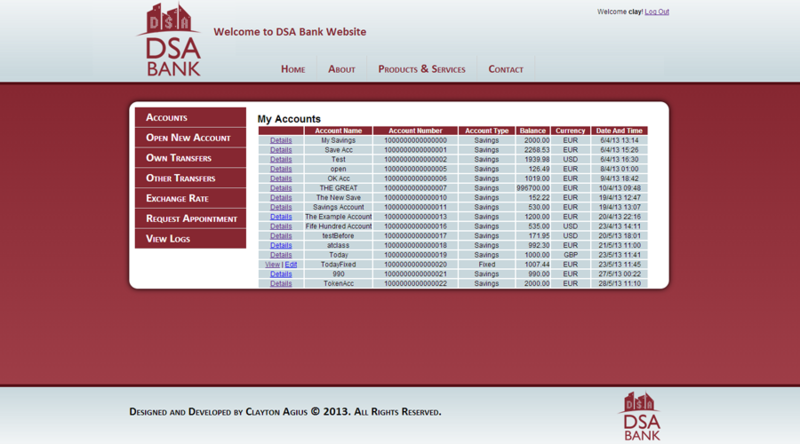 Once the User will be Logged In, he/she could create either customizing a theme from scratch or using an already created theme, so that the user can enhance it how he/she wants. 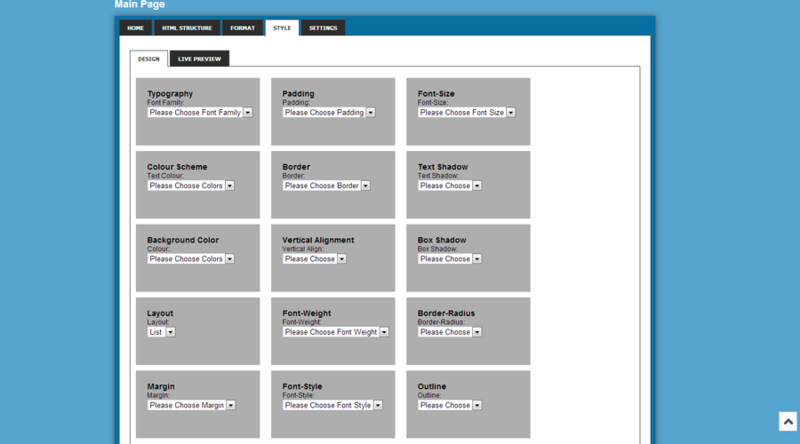 This Web Application is implemented in a way that the user can change his theme styles and html structure in a way that once the user chooses a particular style, this will be changed in the CSS file. 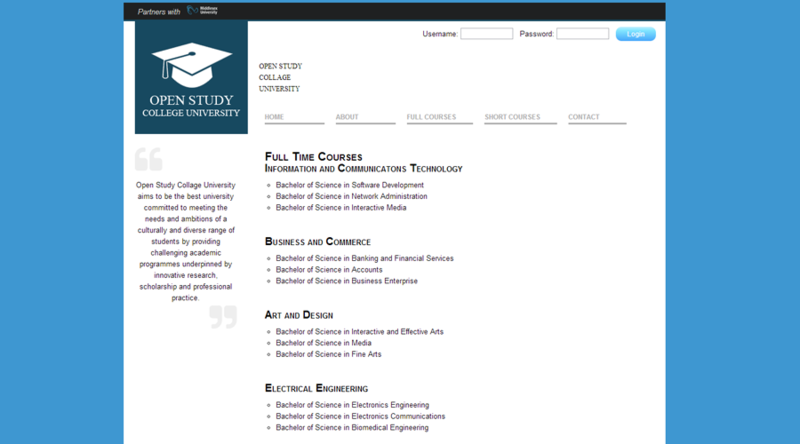 There are many things that the user could change example text color, background-color, etc. The Live Preview is another thing that makes the user to see how the theme looks like. 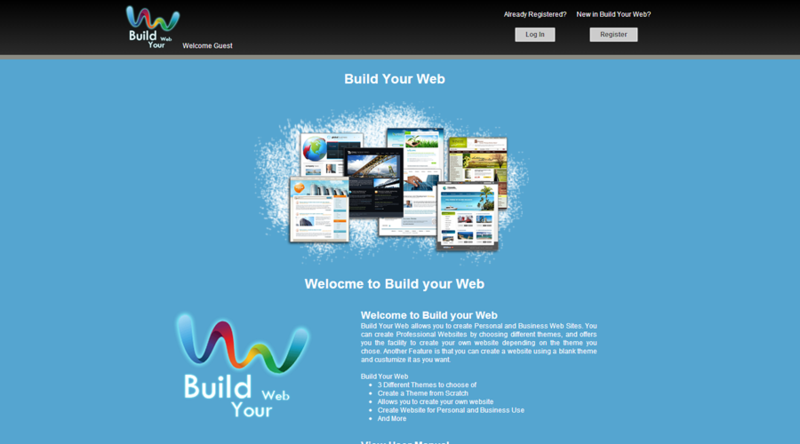 Visual Studio is linked with WebMatrix and WebMatrix is linked with Wordpress. 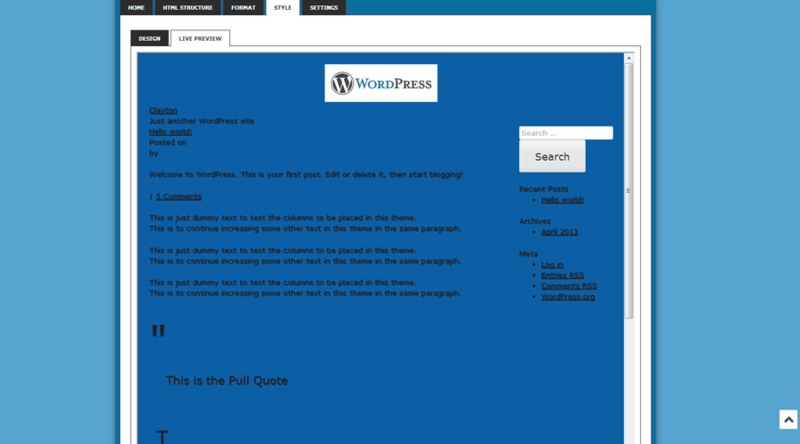 So the changes that the user makes are changed in the wordpress folder under the themes folder. 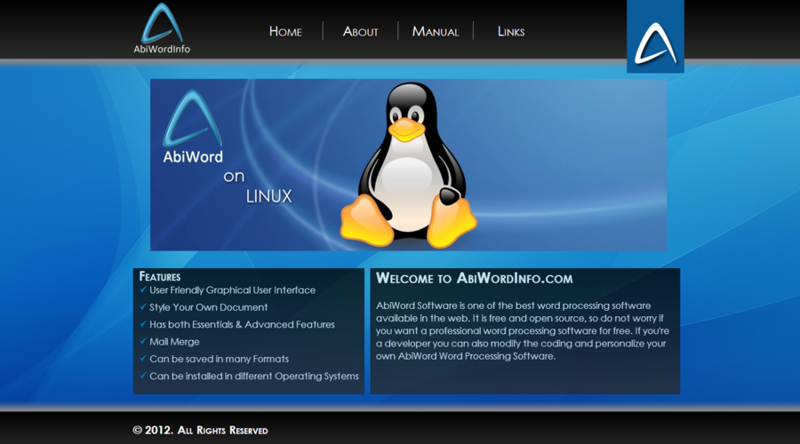 Finally the Theme modified by the user could be exported (downloaded in his/her own PC). 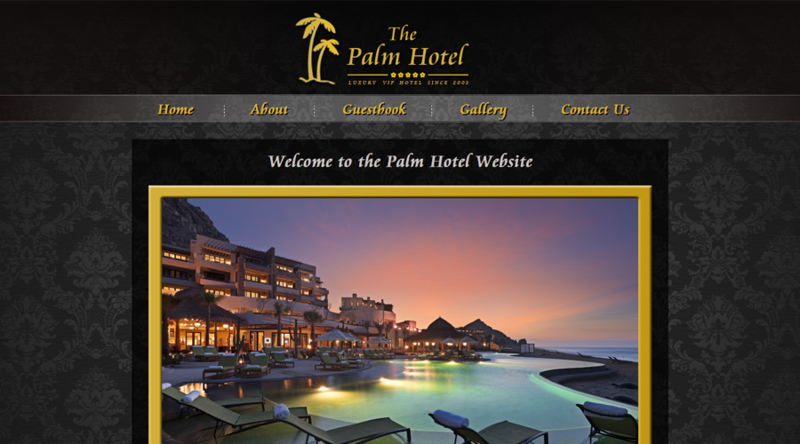 The Technologies used are: Microsoft Expression Blend 4 Sketch Flow, C#, MVC, LINQ, HTML5, CSS3, WebMatrix, Wordpress, PHP and jQuery to make this website. 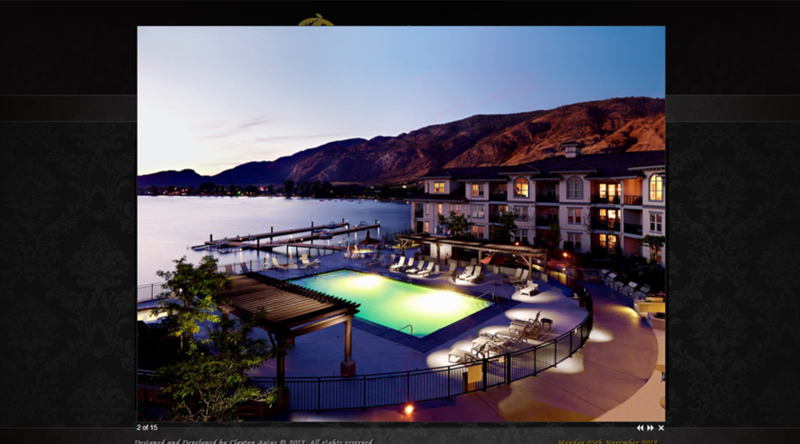 Some of the Images of this website are found below. 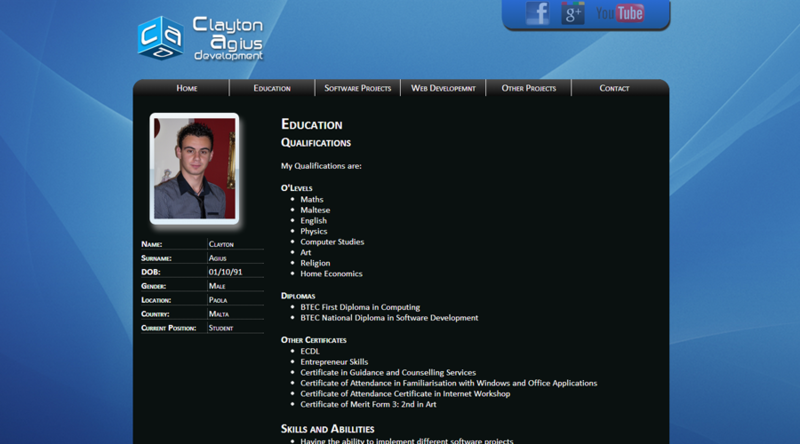 This website was implemented for the Web Applications Development (WAD) subject. 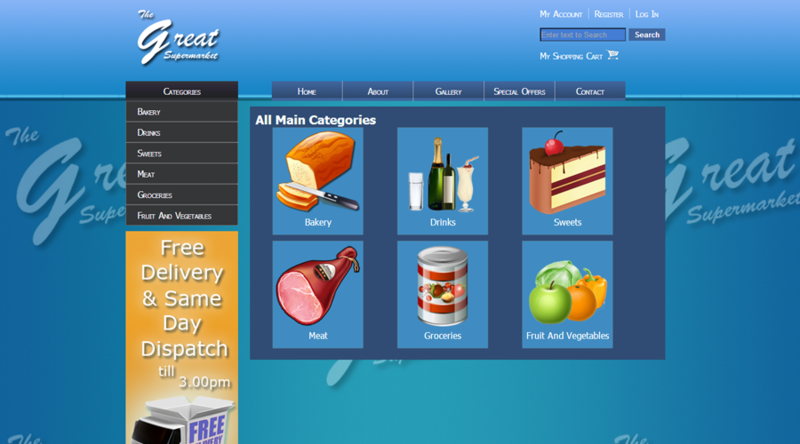 My tasks were to create a Web Application for a Supermarket so that users could buy products from their home. 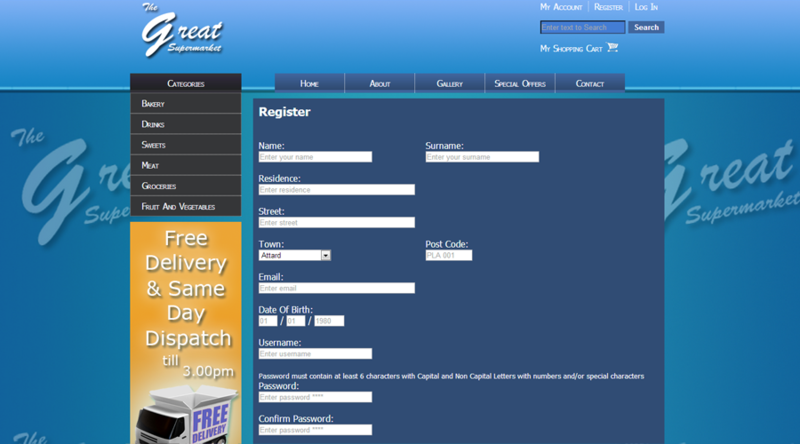 This is done by first of all allowing the users to Register and then Log In into the Website. 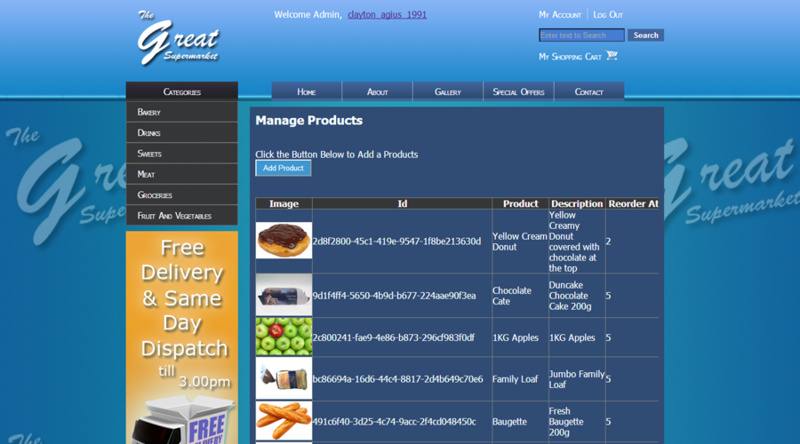 Then they can search for products and add them to their Shopping Cart. 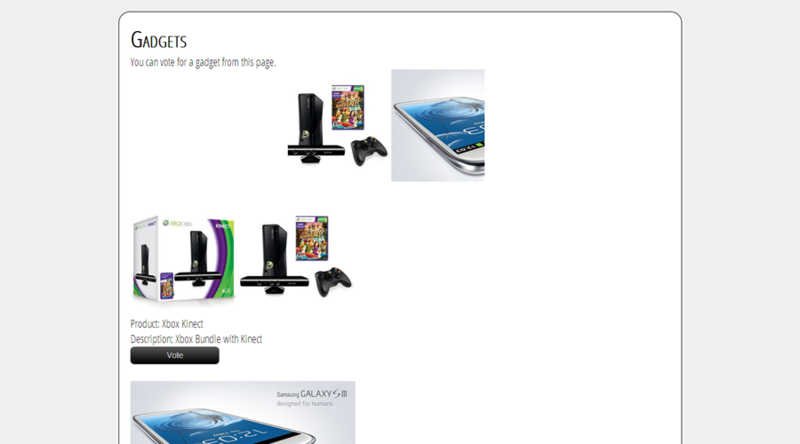 Once added a simulation to buy the added items will be shown (not by PayPal API). 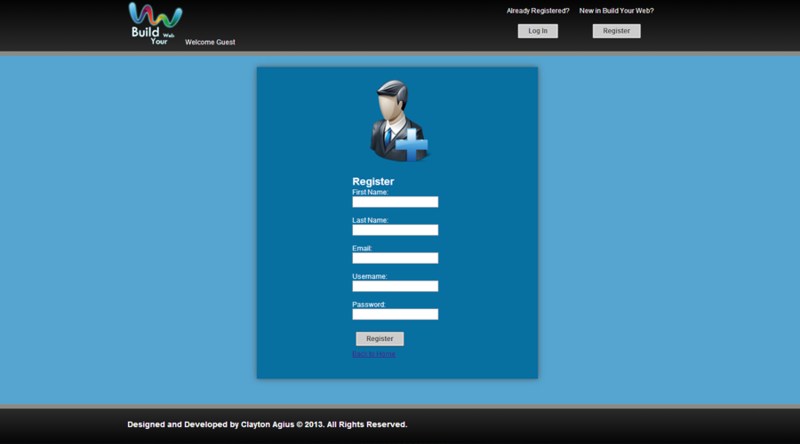 This Web Application consist of 2 different roles which are Administrator and Normal User. 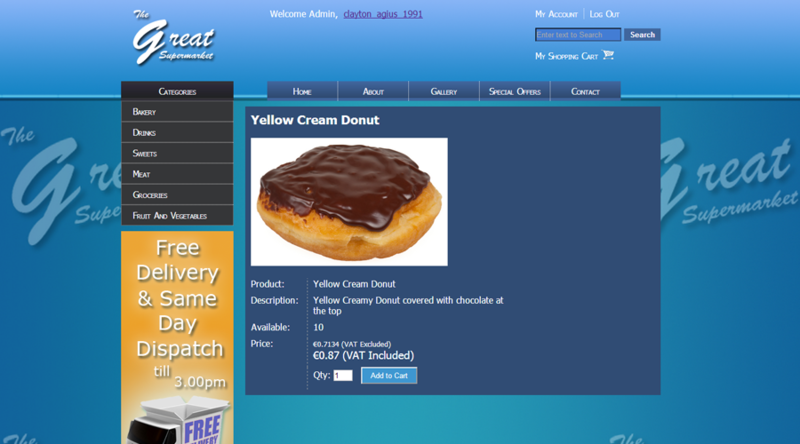 This also contains 3 different User Types which are Supplier, Wholesaler and Retailer. A Wholesaler will buy products cheaper than a Retailer does. A supplier will send an email to the Administrator to sell an amount of products, and once the administrator accepts, the person responsible must enter the new stock amount. 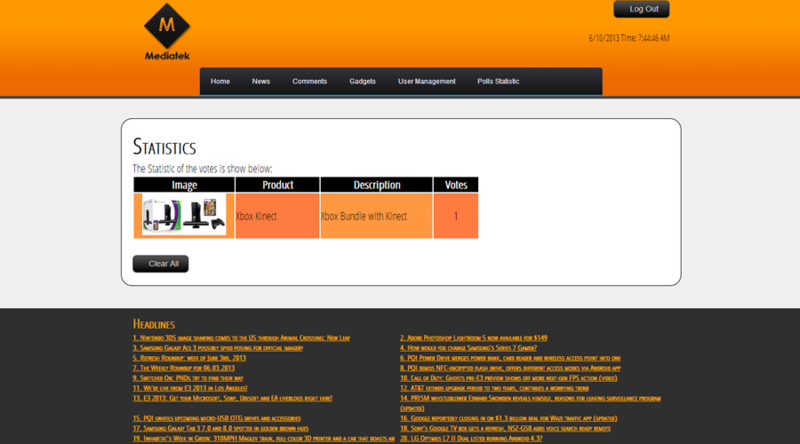 I implemented this Website in a Three Tier Architecture and I also made a Content Management System that an Administrator can add products, add categories, delete users, etc. 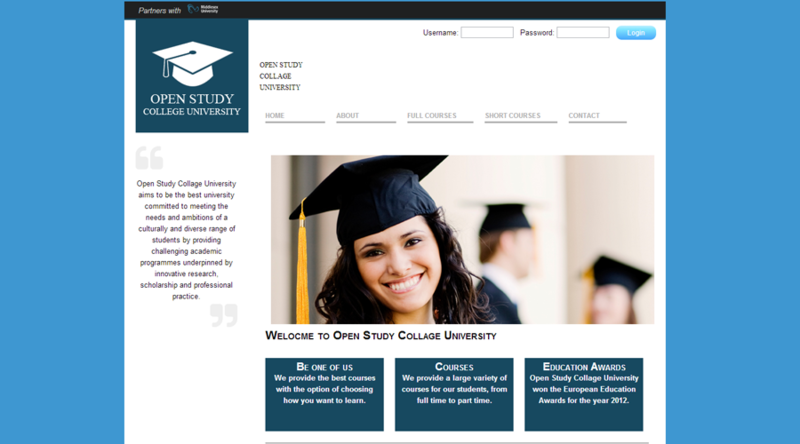 The Technologies used are: C#, ASP.NET, LINQ, HTML5, CSS and jQuery to make this website. 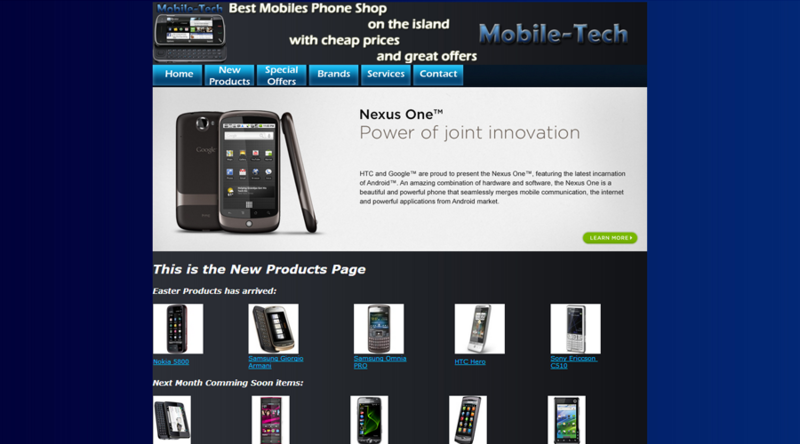 Some of the Images of this website are found below. 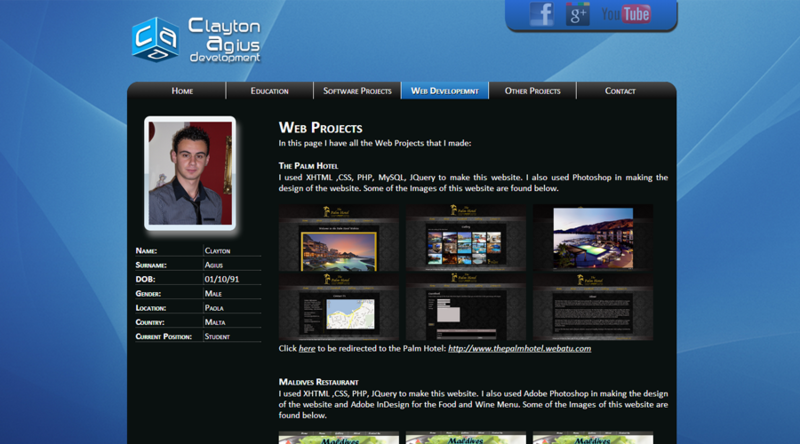 The Technologies used are: HTML, CSS, jQuery and PHP to make this website. 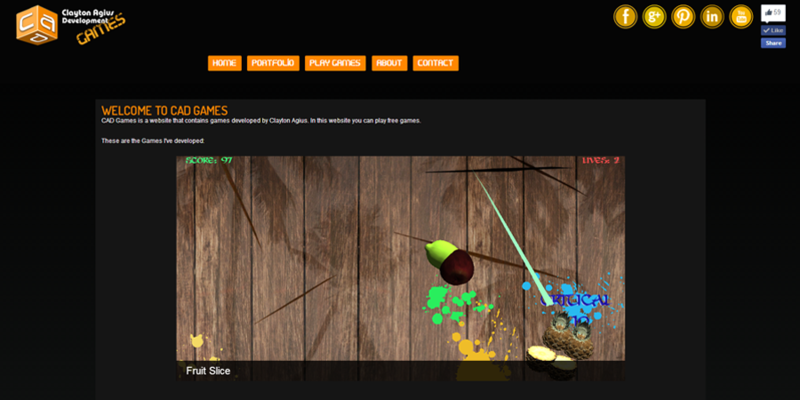 Some of the Images of this website are found below. 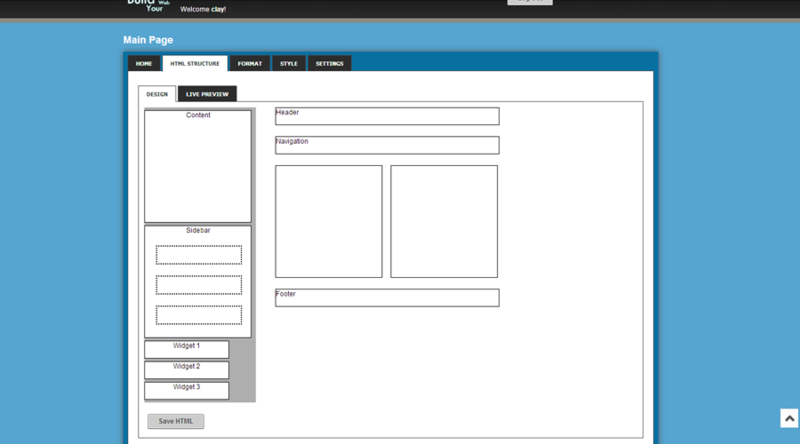 This website was implemented for the Programming in Java (PJHND) subject. 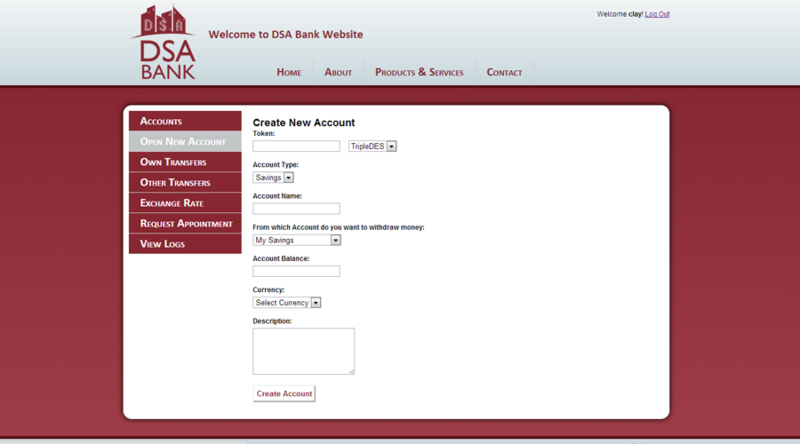 My tasks were to create a web application using JSP to allow the user to Register and then Login into the Website. 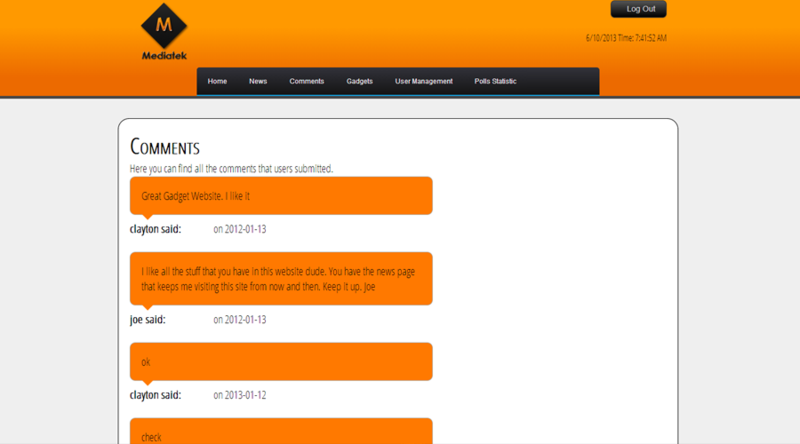 Then the user can leave comments about the website and can vote for particular gadgets. The user can also see the live news by using the RSS Feed and can also see the headlines in the footer of the Web Application. 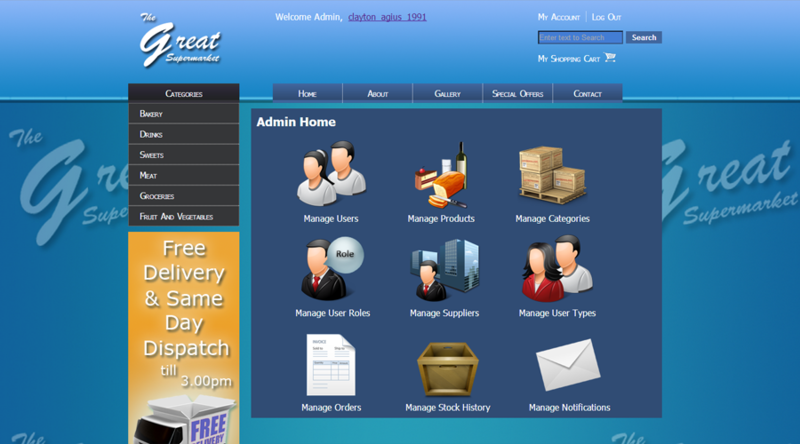 This Website consist of 2 different User Roles which are the Administrator and the Normal User. An Administrator can also delete users and can also reset the voting system. 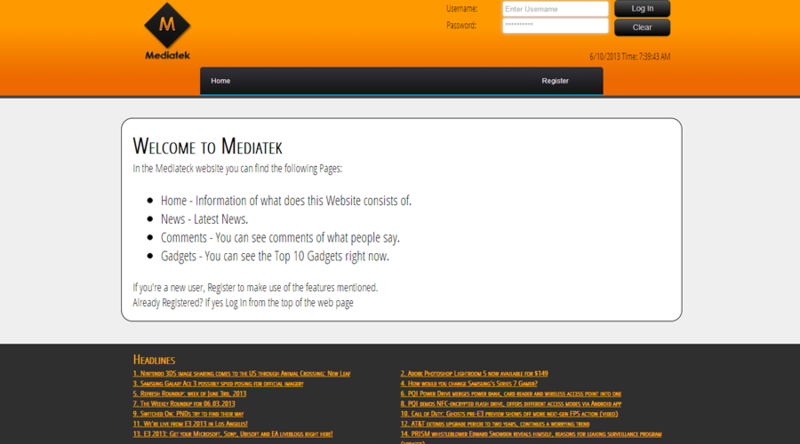 The Technologies used are: HTML, CSS, JSP, MySQL, RSS Feed and jApplet to make this website. 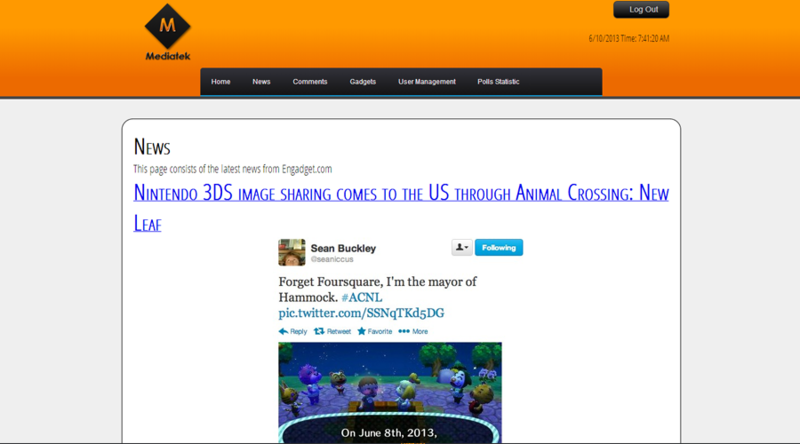 Some of the Images of this website are found below. 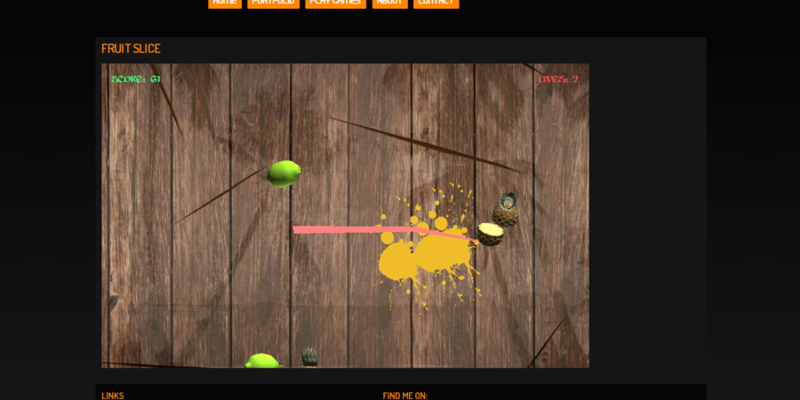 This website was developed in my own free time since I like to create new websites since this is one of my hobbies that I would like to do in my free time. 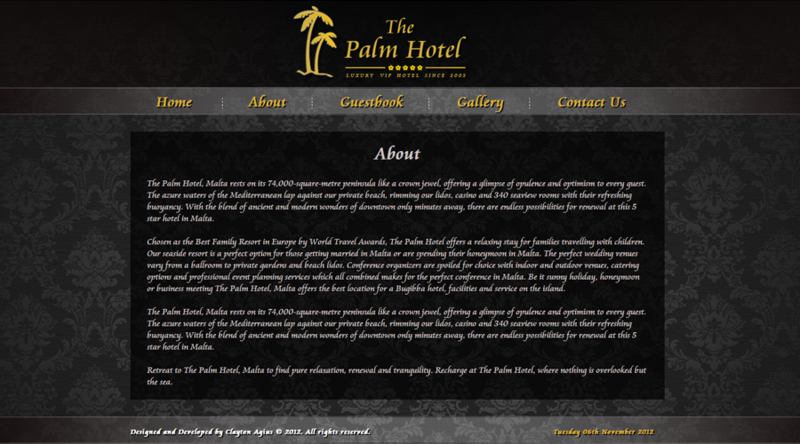 This is a website that contains some information on the Hotel. 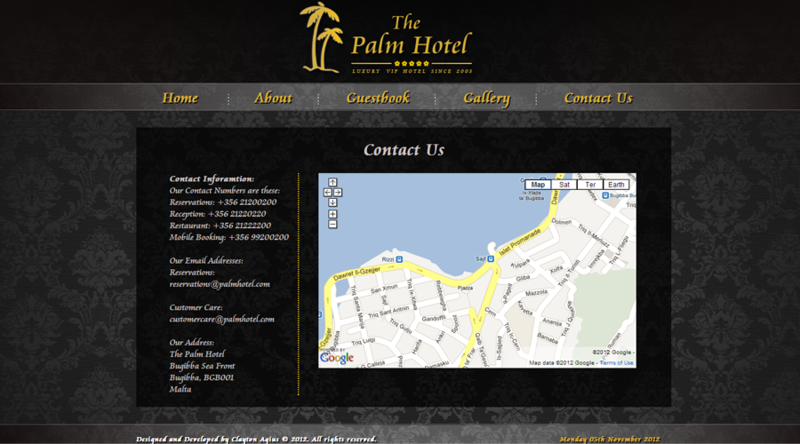 As Web Pages there are the Home Page were there are some information on what the Hotel Offers. 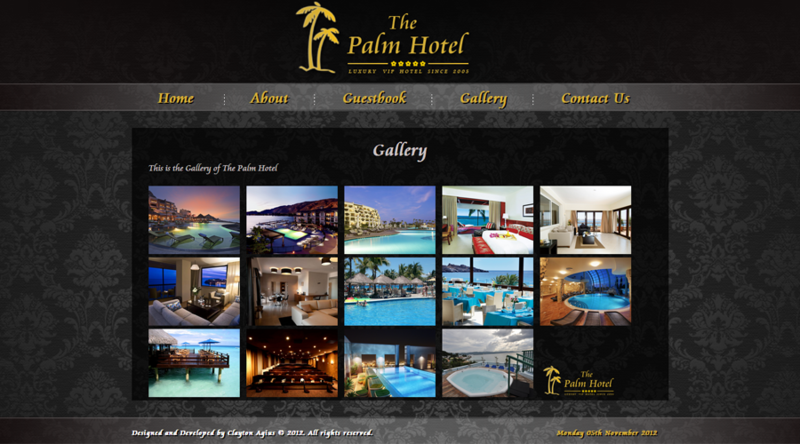 The About Page contains the Information about the Hotel, The Gallery contains the images of the Hotel which these will be displayed using jquery ShadowBox, The Guestbook Page which allows the user to enter his/her own comments, and The Contacts Page which contains the Contact Information and a Map where the Hotel is located. 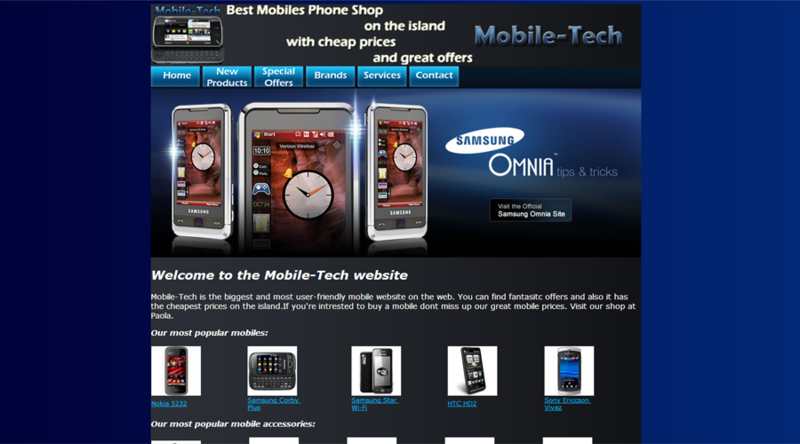 The Technologies used are: HTML, CSS, PHP, MySQL, JQuery to make this website. 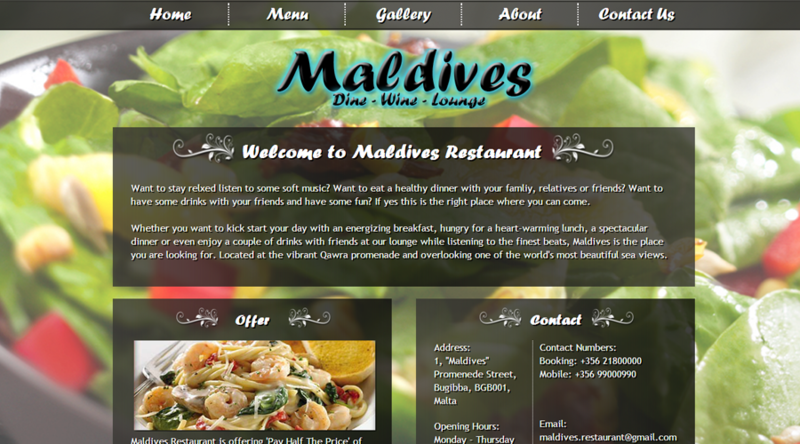 I also used Photoshop in making the design of the website. 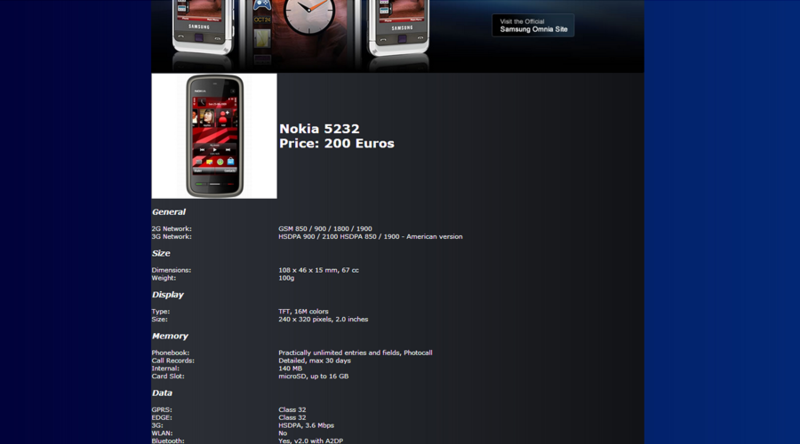 Some of the Images of this website are found below. 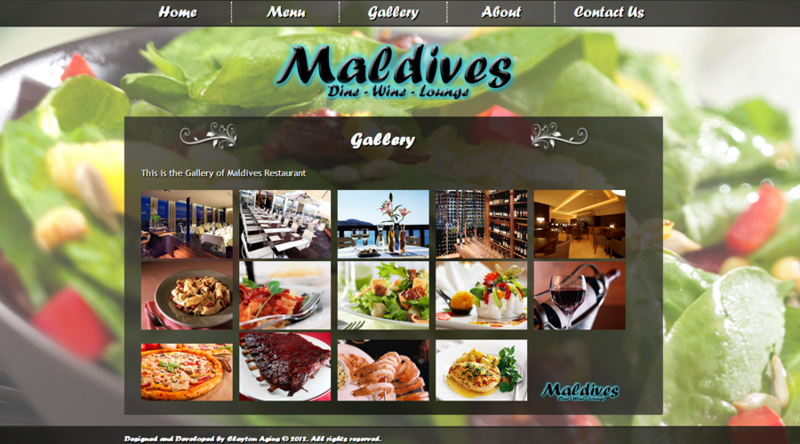 Since I like to create new websites and I consider programming and web development as a hobby, I also developed a Restaurant Website. 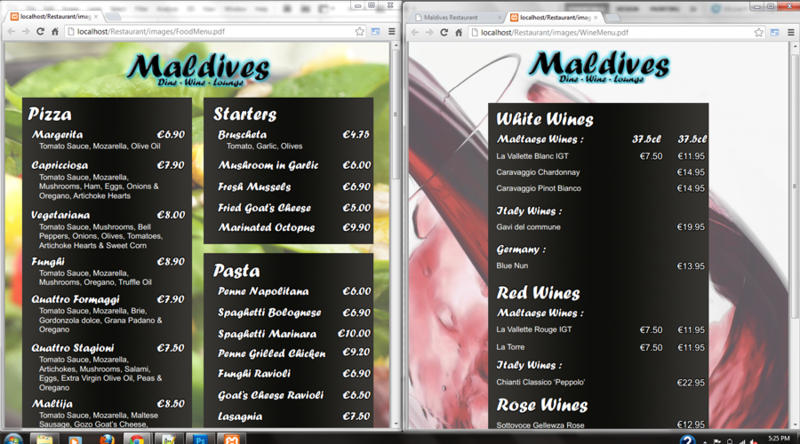 Another thing I've included in this Website is a Menu that was created using Adobe InDesign. 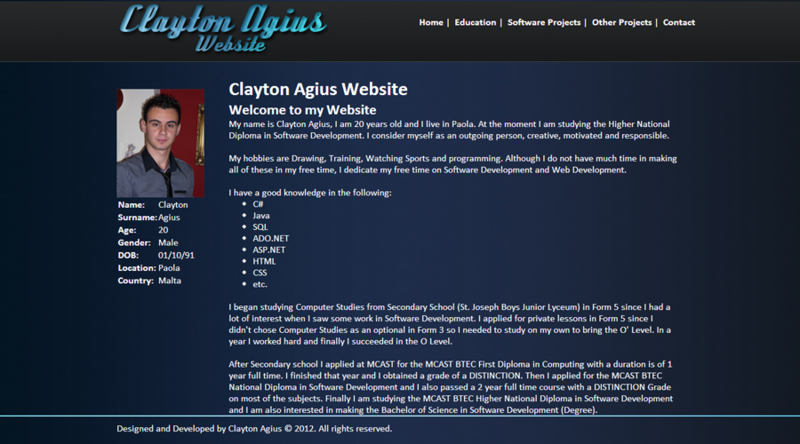 I used HTML, CSS, PHP, JQuery to make this website. 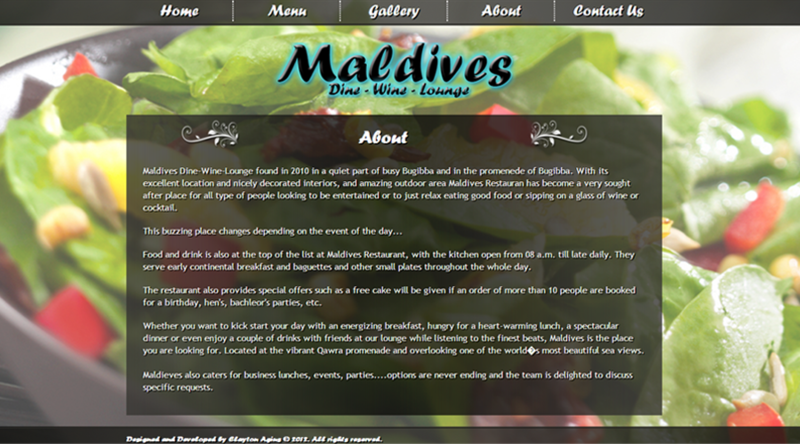 I also used Adobe Photoshop in making the design of the website and Adobe InDesign for the Food and Wine Menu. 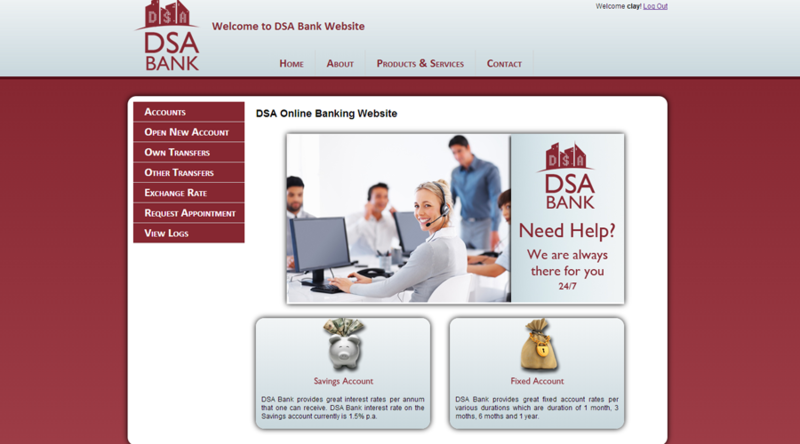 Some of the Images of this website are found below. So my tasks were the Merit and Distinction criteria to create a creative leaflet with professional design and a Website to promote the software. I requested to make these criteria since I like to create new websites and created designs for both the website and the leaflet. 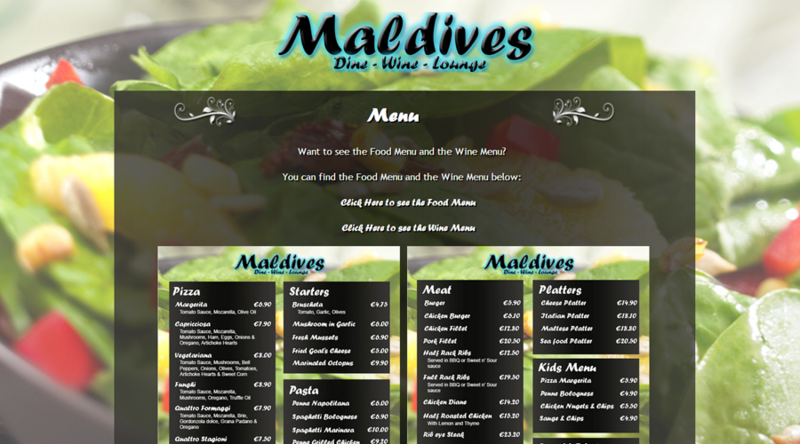 I used HTML, CSS3, PHP and JQuery for this website. I also used Photoshop for the design. 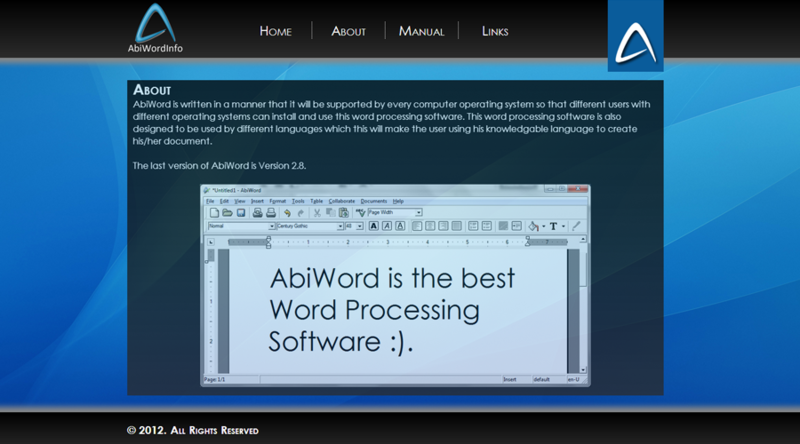 This website is developed because I have to make an assignment in a group to make the user manual and documentation together with a leaflet to promote the software. 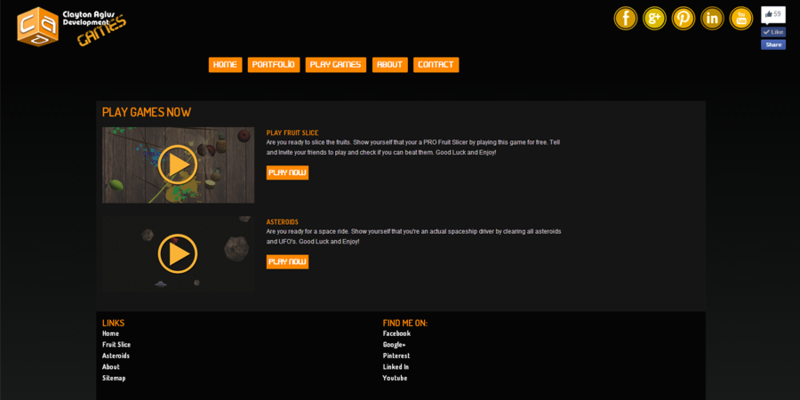 I used HTML and CSS to make this website. 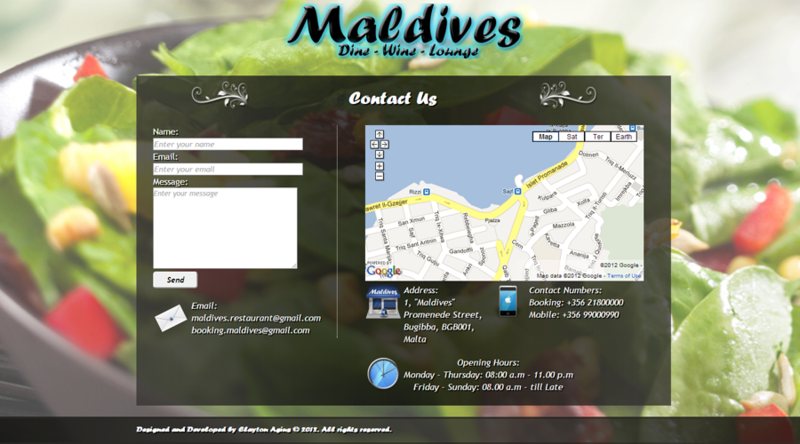 I also used Photoshop in making the design of the website. 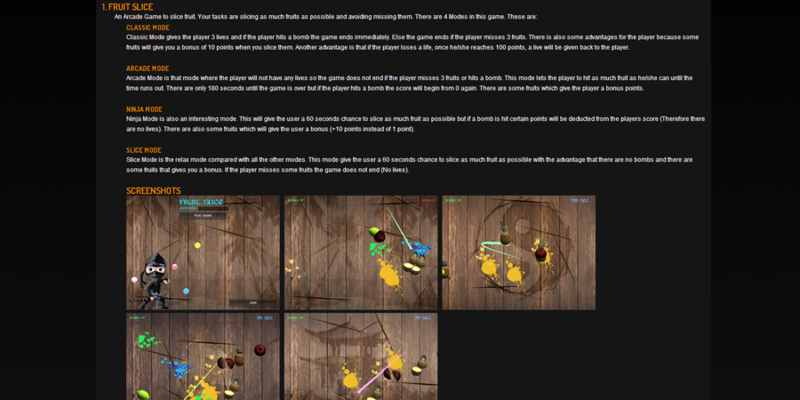 Some of the Images of this website are found below. 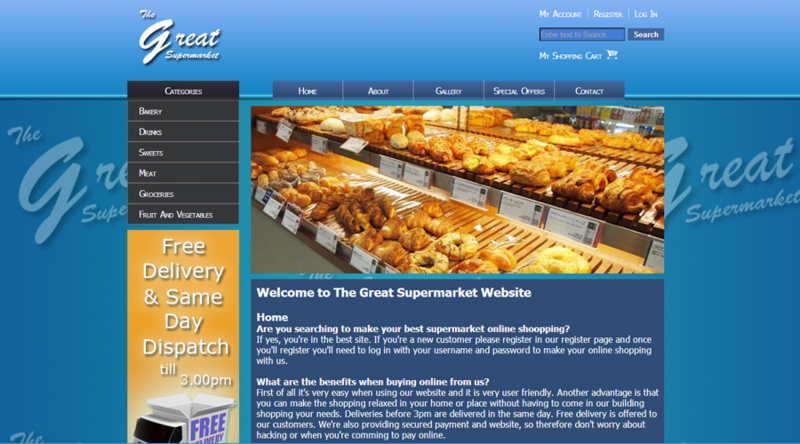 I used HTML and CSS for this website. I also used Photoshop for the design.